3 Bedroom, 2 Full Bath Cottage With 100 Feet Of Private, Sandy Beach. 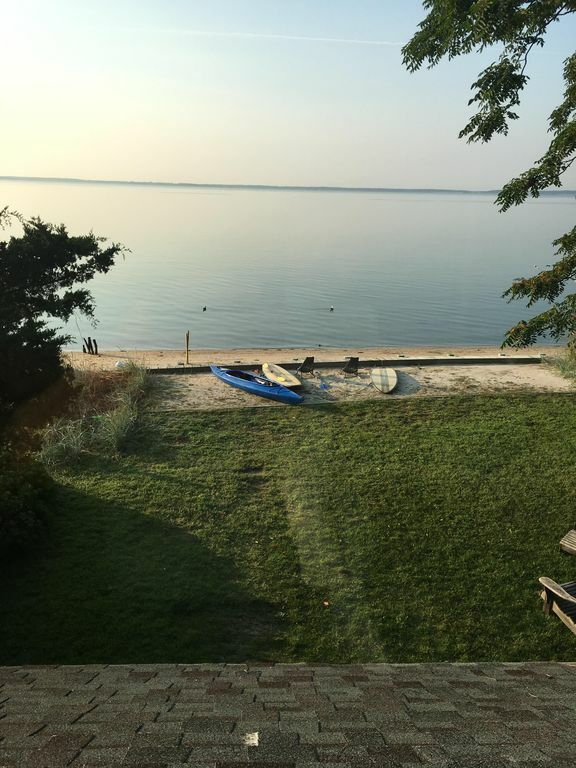 Bayfront three bedroom cottage just steps from the water, with panoramic views of the Peconic Bay. The property sleeps six and has a beautiful outdoor living space for guests to enjoy. Swimming, kayak and paddle board on your very own beach, or walk to a town beach with lifeguard supervision. The house is equipped with central air, hardwood floors and washer/dryer, linens and towels and is dog friendly. First floor: Brand new kitchen with stone countertops, dining area, living room, full bath and covered victorian porch. Second Floor: Three bedrooms one with a king and one with a queen and a full size bed. Located in central Mattituck - easy access to all North Fork vineyards, farmstands, Greenport's shopping,-while walking distance to the Jitney, supermarket and Magic Fountain ice cream shop. Steps to bay beach with kayaks and paddleboards for exploration and enjoyments Easy access to vineyards and local restaurants on the North Fork. This house comes with two kayaks and two paddleboards. Sliding glass doors off the porch insure light and breeze all day long. Should the breeze not blow, the house has central a/c. We had an amazing time. The cottage is perfect and the location is awesome. We all fell in love with this waterfront cottage. Our stay In Mattituck was fantastic, can’t review highly enough. Everything we needed was catered for ( even the weather on some days!). Will definitely return . What a delight to stay in this sweet home for two weeks! Recently refurbished with comfort & carefree living in mind, the views from the living room & front porch are stunning! Facing the Paconic Bay, you can see Robbins Island & the south fork. We loved sitting on the bench on our own private beach, watching the sailboats, motorboats and occasional osprey fly by. The new kitchen & two full baths have been attractively updated. Beds are super comfortable. The owner Ron is easy to contact & very accommodating. Close to many vineyards, restaurants, farm stands & food markets, this cottage has it all! Having had one of our best vacations here, we look forward to returning next year. Thank you Ron for a memorable time. When we pulled up to the house and walked inside, my jaw dropped. The views are just incredible and we felt like we could have been on a boat, that’s how close the water was. The house was clean and modern. The beds were very comfortable. The house had everything we needed for our small children. Kayaks, paddle boards,beach chairs were all available to us. We loved taking the kayaks and paddle boards on the calm bay every day. The beach is sandy (uncharacteristic for the NOFO). The house is also in the perfect location. Close to supermarket, Starbucks, bagel store, a great ice cream place and the shops on love lane. There is a great playground a short walk (either on the road or down the beach). We were so sad to leave. It’s truly paradise. Can’t wait to return next summer! We’ve stayed here twice in the last two months and we’ve had a wonderful time. The north fork is gorgeous, peaceful and full of charming farms and vineyards to explore. The home is pretty perfect! The location was perfect for our family of five. We all enjoyed the clean quiet beach and the park down the road. It was the perfect get away for a us. No schlepping to the and from the beach with gear which made it all the better. The house was clean, simple and welcoming. The hosts were helpful and easy to get in touch with when we had questions. We’ll be back! We enjoyed a wonderful stay at a great beach cottage in Mattituck. The cottage provided the perfect amount of space for two couples visiting wine country, as well as taking in the US Open. We were able to relax, grill and spend some quality time overlooking the Peconic Bay which was very peaceful! Wish we had time for one more day to get some kayaking in! Would recommend this home!